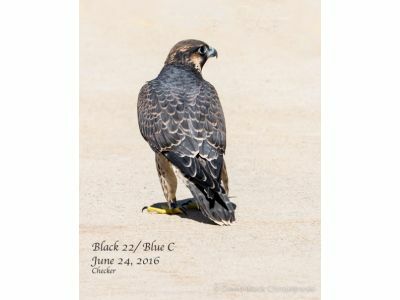 Checker (22/C Black/blue) returned home this afternoon after spending about 10 days at the Braveheart Raptor Rehabilitation Center to recover from injuries acquired as a result of his impact with the Radisson. Luckily the injuries were soft tissue in nature rather than a fracture and resolved with cage rest and a few days of practice flying. Both his parents, as well as a few human well-wishers, including his friends from the Radisson, were on hand to see him off. His dad and one sibling joined him in his initial flight out of the carrier. He rested for a short time, then had a good strong flight and was joined by his mother, Rebecca. We hope that he is past his accident-prone stage (he did end up turtled on his back as a new hatchling and then fell into the window well of the parapet twice prior to fledging and had to be rescued). Actually, we hope all our fledglings stay safe and air-borne, as we hear sad news about other Michigan Peregrines (more in a later post).